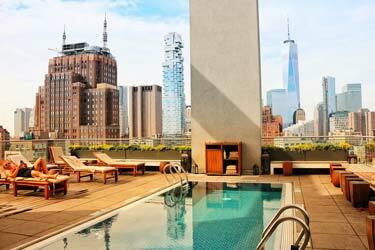 Nothing beats a big city weekend where you can combine swimming in a rooftop pool along with shopping and some nice dinners. 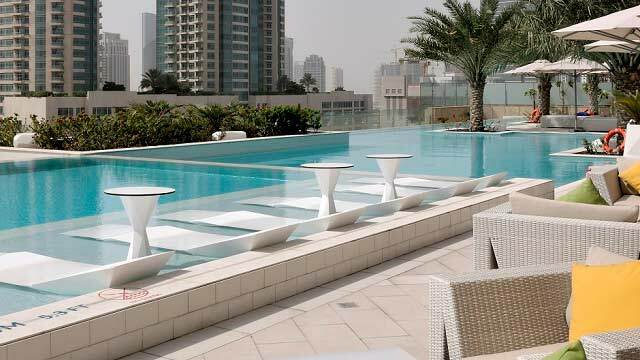 We have therefore summoned a list of the best rooftop pools in Dubai. 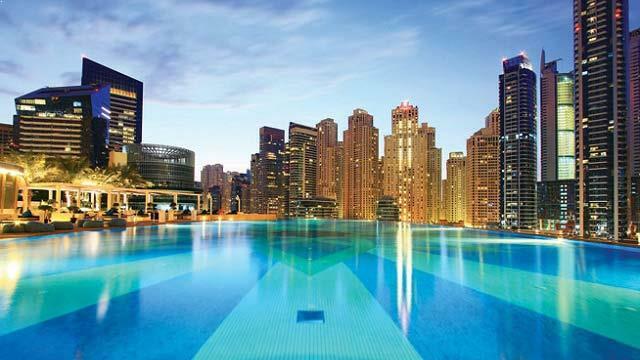 There are some superb Dubai rooftop pools to choose from. 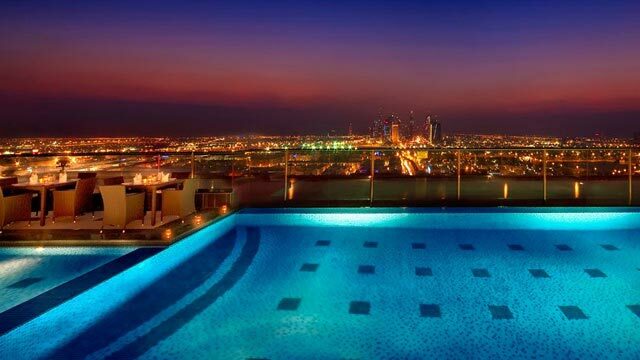 A typical Dubai rooftop pool is located at a luxurious hotel with a fancy skyline view over the city and its surroundings. 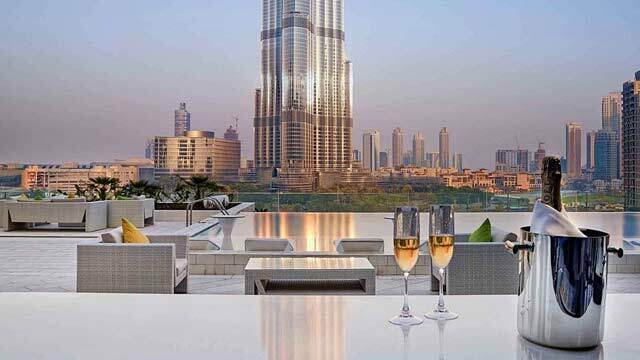 Also don't forget to check out the best Dubai rooftop bars. 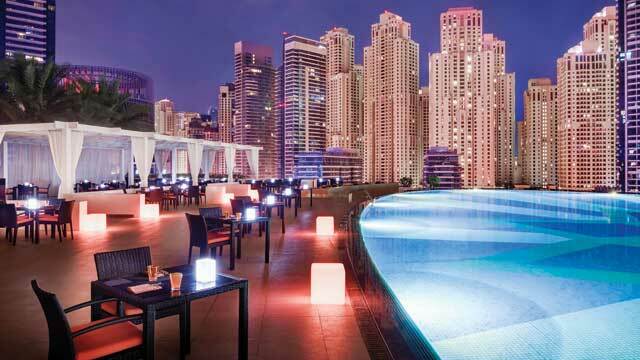 The Address Dubai Marina have one of the largest rooftop swimming pools in Dubai. It’s almost 50 meters in length an equally wide. 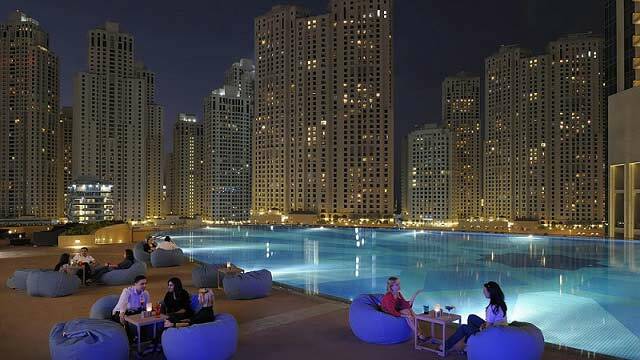 The fact that the rooftop pool is located among all the skyscrapers in the Dubai Marina, makes the view amazing – both during the days and nights. The side of the pool with views over the marina and yachts have a cool infinity feeling to it. Perfect place to hang out at while gasping out over the boats and people on the marina walk. 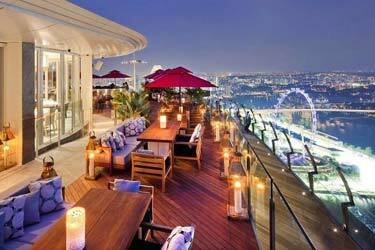 If you also like to eat, you can order fantastic food and cocktails from the rooftop restaurant. 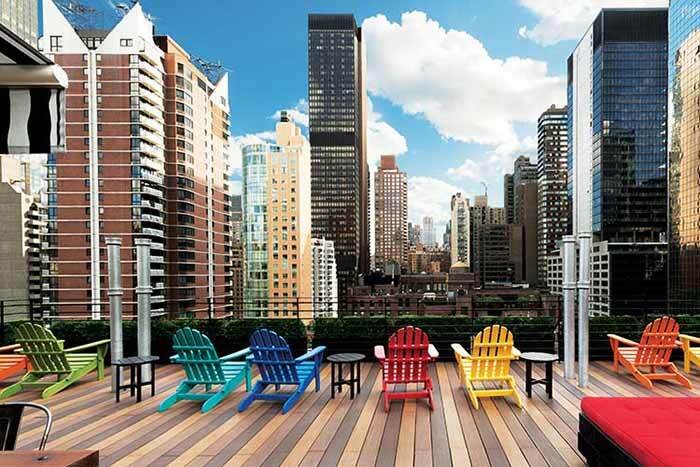 Both the rooftop pool, restaurant, bar and hotel have everything one can ask for. 5 stars – just as the hotel have. 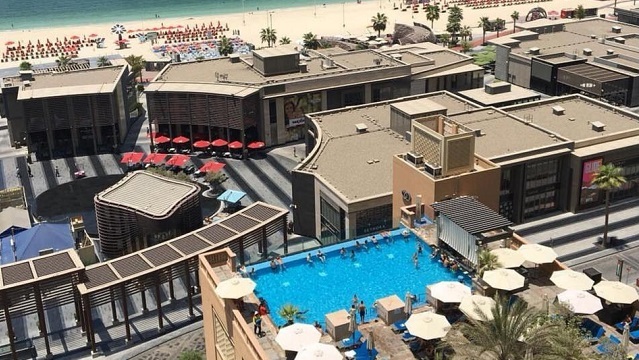 This famous Dubai rooftop pool is located in the older parts of Dubai north of downtown. 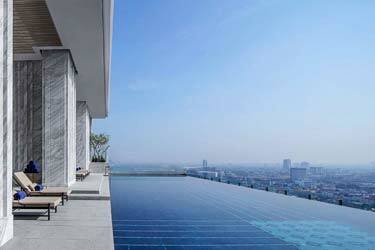 At the 5-star hotel, Park Regis Kris Kin and their rooftop, toy will find this hidden gem. The location is little bit off, but what it lacks in location, it delivers in view. Amazing skyline views over downtown Dubai and you can see all the way to the marina and Burj al Arab when the weather is fine and clear. 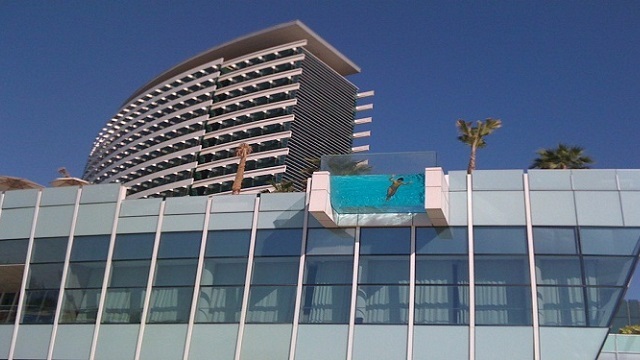 As with all other Dubai rooftop pools, it’s only available for the hotels guests. In the winter time the pool is quite cool, because they never warm it up. If you think that the water is to chilly, you can relax in comfortable sun loungers and order some tasty bar bites to nibble on. 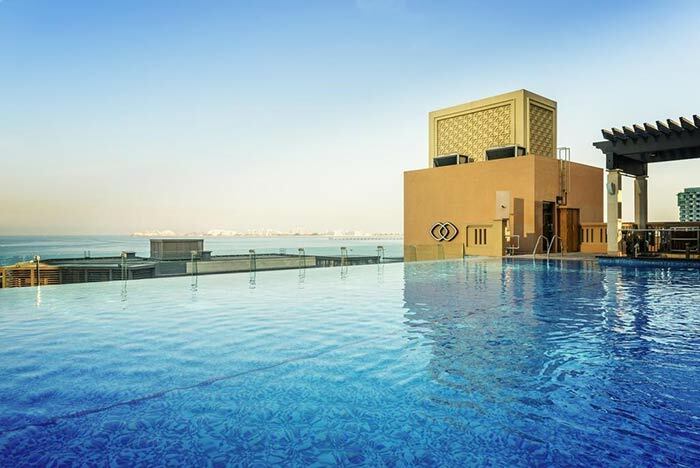 The swimming pool at Sofitel Dubai Downtown is very large and luxurious. 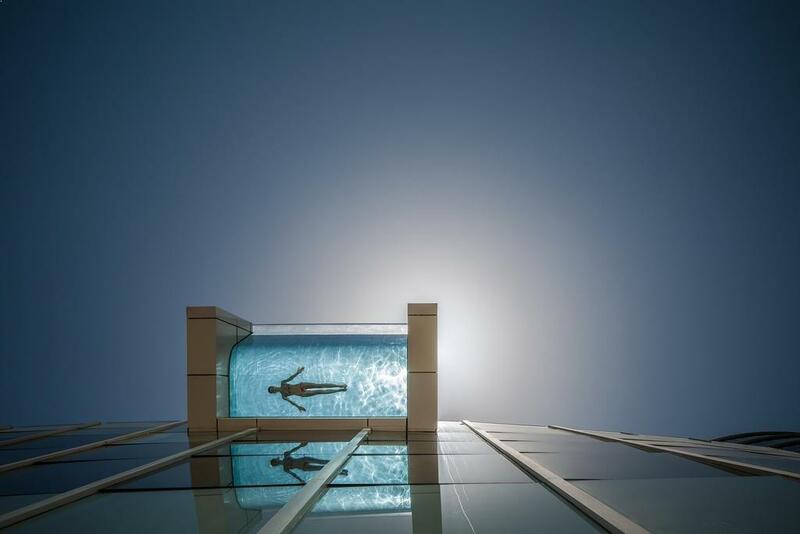 This rooftop infinity pool is located at the 5th floor, but despite to low altitude, you’ll get a magical view over the world’s highest building – Burj Khalifa – from here. 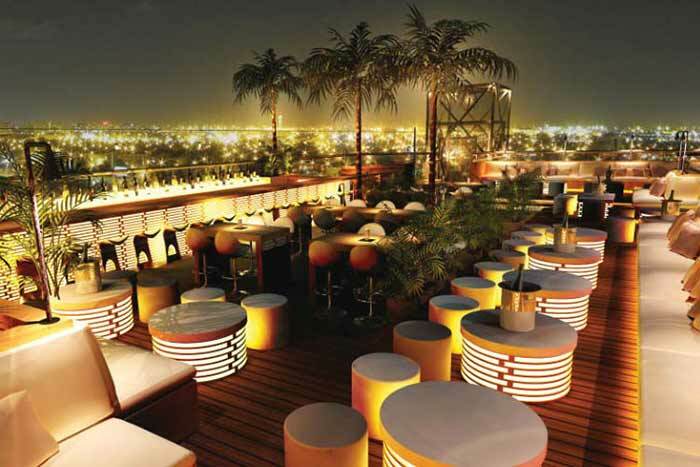 Both the terrace and its décor is super luxurious. 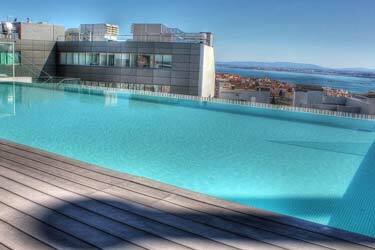 The only catch is that you have to be a guest of the hotel to be able to use this fantastic rooftop pool. 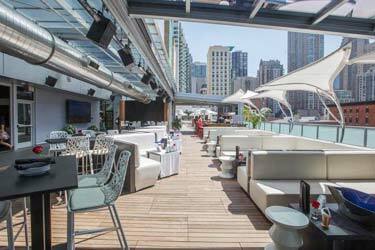 In addition to the pool, there’s also a good rooftop bar here called Above Lounge. Perfect if you like to wind down with some cocktails in the evening. 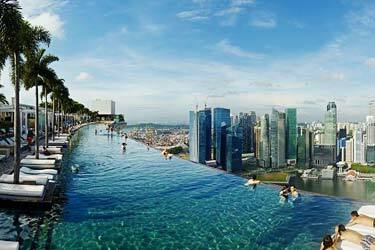 Sofitel Dubai Jumeirah Beach can show off with one of the coolest rooftop infinity pools in Dubai and the world. 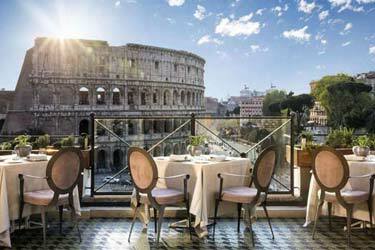 The fact that it’s located on the rooftop of the hotel makes the view and feeling even mightier. The view is breathtaking over the Palm and the Arabian Gulf. Make sure to time a sunset here, and you will have some awesome photos. One of the best sunset views you can find in this luxurious city. There aren’t many better places for a sunset, than from a rooftop infinity pool with something nice to drink in your hand. And for the hungry ones, the rooftop bar serves lovely Meze platters. The fantastic hotel InterContinental Dubai Festival City has this lovely rooftop pool in Dubai. 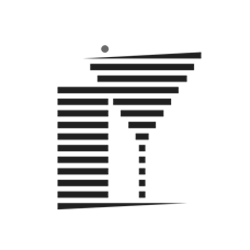 Thanks to the InterContinental's Dubai Creek vantage point, the persons hanging out by the rooftop swimming pool have a good view point of all dhows that are cruising by outside of the hotel. 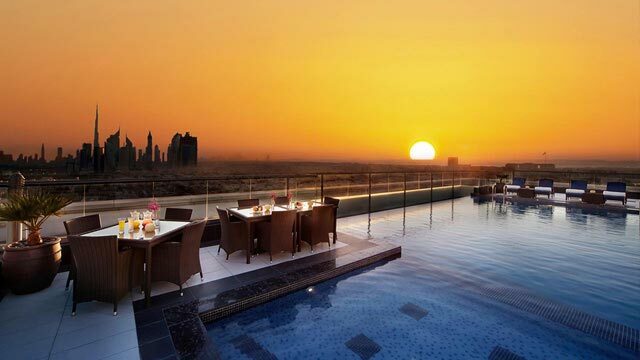 A perfect Dubai rooftop pool for the warmer days. The swimming pool as a nice and cool temperature. 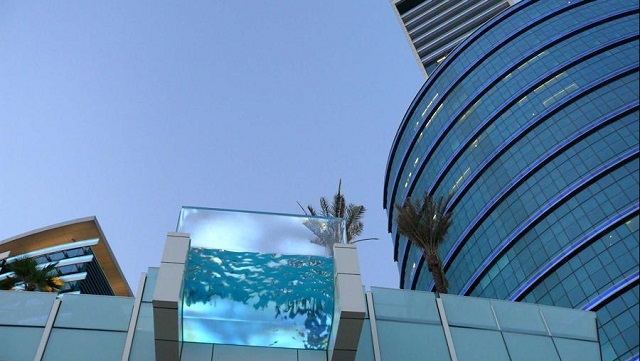 But the coolest thing with this pool is the transparent glass tank that hangs out from the side of the building. This will blow your mind away, or even scare you. This part is perched on the 25th floor where you can see all the way down to the street from the bottom of the swimming pool.